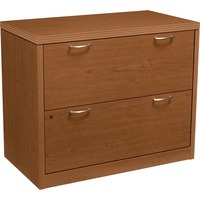 HON Valido Lateral File HON11563ACHH $556.19 Two drawer lateral file is part of the HON Valido Series that combines the durability of laminate with a decidedly upscale impression. Precise ribbon profile on all edges adds a distinctive touch and designer detail. Bourbon Cherry laminate over 1 12 thick, solid core, high performance particleboard is scratch resistant and stain resistant. Drawers operate on a long lasting, full extension, ball bearing suspension and offer five sided construction for easy drawer alignment. Included hangrails allow easy filing. Interlock inhibits the extension of more than one drawer from opening at a time. Adjustable hex leveling glides allow floorstanding furniture to be easily leveled glides have 34 adjustable range. Lateral file is certified by SCS to be in compliance with specific, indoor, air quality emission requirements and meets or exceeds applicable ANSIBIFMA standards.